Highline has been actively involved in the tourism industry since 1995. We continue to build lasting global relationships with companies and other parties. Born in Vanderbijlpark, South Africa, Frikkie was always a keen sportsman and received National Colours for Canoeing in 1990 while studying for his B.Com (Law) degree. He competed in various international countries representing South Africa. As part of the national canoeing team in 1992, Frikkie befriended Pierre Strydom, the team manager. They discussed South Africa’s future at length, and agreed that, if things came right, the tourism industry would boom. Leading and motivating people to perform in a climate of constant change. Negotiating and building lasting relationships globally with clients and other parties. The Highline Management Team trains, leads and motivates its consultants to perform in a climate of constant change. We combine a wealth of expertise, product knowledge and destination management skills to ensure client satisfaction. A dedicated consultant deals with each account to meet unique requirements and ensure a safe, reliable travel experience. Our vision is to leave a legacy of creating the best possible holiday for our clients, encouraging them to become ambassadors and repeat visitors to our beautiful continent. To meet and exceed expectations, never compromise on standards and uphold long lasting relationships with our clients and suppliers. To operate with integrity and fairness to gain respect and trust. To act in a responsible manner in order to achieve sustainability. To make a contribution to society by addressing the spiritual, emotional and physical needs of people. To constantly reinvent ourselves and create innovative travel ideas. To see problems as opportunities for solutions. To be a highly motivated, energetic, knowledgeable and committed team who are supportive, appreciative and understanding of one another. To contribute to a positive working environment and deliver service with a personal touch, whilst having FUN! Highline Tours & Travel is actively involved in the Hay for Horns Campaign in support of the Hoedspruit Endangered Species Centre (HESC) in South Africa. 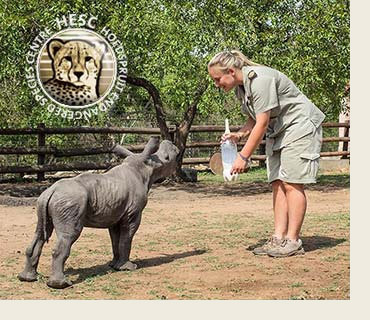 Amongst their many other breeding and research projects, HESC also treats and cares for rhinos who have survived horrific injuries inflicted on them during poaching attempts. Highline has made a long term commitment to donate towards the care of these traumatised rhinos. Highline Tours and Travel understands the importance of supporting local communities and realises the impact, both negative and positive, tourism can have on the lives of the people living near major tourist destinations. We understand the importance of responsible tourism and have always been sensitive to the needs of the local communities we operate in. It is for this reason, that our directors created the Vanhu lava Hlayisaka Foundation in 2008. The foundation, which means ‘People who care’ in Shangaan, has always aimed to build and develop the Mnisi community whose land borders the Kruger National Park. The foundation strives to gain an in-depth knowledge and understanding of this community’s challenges and needs, in order to help individuals, families, local businesses and non-profit agencies to achieve their charitable and financial goals by providing tools and resources. The foundation’s main and ongoing project is the Ntshuxedo Day Care Centre. It is the only day care centre in a radius of 10 kilometres and therefore vitally important to many of the working mothers who work at tourism establishments in the area. It is a safe environment where children receive two meals a day and are provided with a good educational foundation before they start Primary School. On average there are about 85 children, aging from one to four years old. The children are taught in both Tshonga and English. Apart from the Day Care Centre, we also have numerous other projects which we complete through donations received from tourists. In 2013 we were able to sink a borehole on the Day Care Centre’s premises. The foundation was also able to erect four flushing toilets and has made improvements to the kitchen. We are currently in the process of acquiring funding for a new vegetable garden, a sandpit and a jungle gym for the Day Care Centre as well as a souvenir shop where artists from the local community can sell their arts and crafts to tourists. We are proud to be members of SATSA and Travel Smart Crew. The Southern African Tourism Services Association (SATSA) is a member-driven, non-profit association representing the private sector. Travel Smart Crew is a tour operator consortia and the preferred partnership for medium sized inbound Tour Operators who maximize buying power through group strength. Highline Tours & Travel has been proudly partnering with Djoser for more than 21 years bringing tourists from the Netherlands to the beautiful African continent.